Even though I’ve loved the Star Trek universe since I was a kid, I don’t know enough details to call myself a “trekkie.” But one thing is clear: I have a soft spot for Gene Roddenberry’s original series (1966-1969) and the crew of Captain Kirk (William Shatner), science officer Spock (Leonard Nimoy), medical officer McCoy (DeForest Kelley), chief engineer Scotty (James Doohan), communications officer Uhura (Nichelle Nichols), helmsman Sulu (George Takei) and navigator Chekov (Walter Koenig), boldly going where no man had gone before. Watching reruns of the original show when I was growing up, as well as reading young-adult novelizations of the episodes, was an enormous influence in my interest in science fiction and space in general. The movies started coming in 1979 with Star Trek: The Motion Picture and ending in 2002 with Star Trek: Nemesis, the last of four films with the cast from Star Trek: The Next Generation (1987-1994). 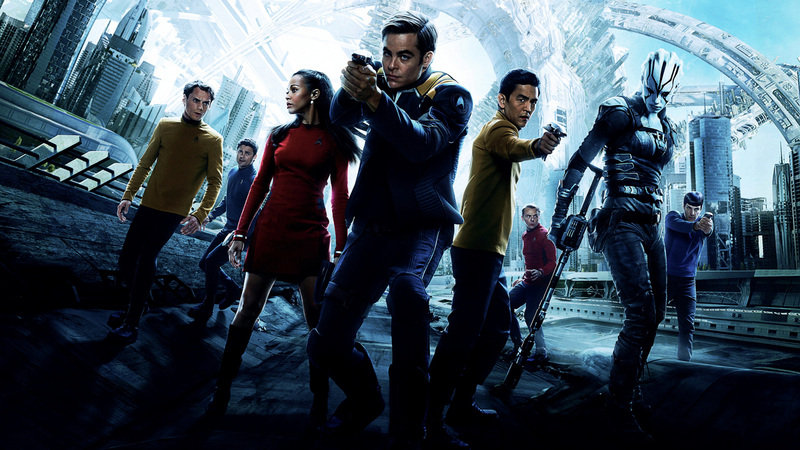 Seven years later Paramount Pictures and director J.J. Abrams rebooted the franchise with a whole new cast in the roles of Kirk, Spock, McCoy, and the rest of the gang. The result was the surprisingly fun and lens-flare-filled Star Trek (2009). I was, if not completely sold, at least cautiously optimistic. But then came the grim and erratic Star Trek Into Darkness (2013), a film not even Benedict Cumberbatch could make palatable. My hopes were quickly crushed. Star Trek Beyond is even worse. The plot has the Enterprise crash landing on a planet and facing an evil warlord (Idris Elba) intent on destroying the Federation. Right from the outset you can tell that writers Simon Pegg and Doug Jung just want to make this a zippier, action-packed, funnier installment than the previous fiasco. Too bad director Justin Lin is the wrong fit for it, going for skewed angles and upside down shots as if he was still on the set of Fast & Furious 6. By the time Kirk (Chris Pine) gets on a motorcycle to create a diversion, I was ready to walk away. But I bravely hung on, only to witness a climax in which a fleet of enemy ships is destroyed by blasting the Beastie Boys’ 1994 hit Sabotage. No, thanks. This ain’t Star Trek. Beam me up, Scotty. That “Star Trek Beyond” is by far the worst of the “new” Star Trek movies is an understatement.